With soaring property costs, buying a house has become very expensive or almost impossible without availing a loan. There are many national or private banks and Non-Banking Financial Companies (NBFCs) in India that offer various home loan options. Over the last two decades, the demand for home loans has increased manifold in India. It is not important that every borrower will need a home loan to buy a home or property. Home loan can be availed for a variety of purposes. Home purchase loan is the most common and sought after product of home loan, it is availed to buy a new home or a home under resale. The lenders generally provide upto 85% of the entire amount required to buy the house. You can get these loans at fixed rates or floating rate of interest. You can claim income tax deduction on the interest paid on such loans. All leading banks and NBFCs provide such loans. This type of loan is exclusively offered by banks or NBFCs to purchase a land or plot on which the applicant is looking to build his/her house. The rate of interest applicable on land loan is as per home loan but you are not entitled to claim tax deduction on the interest paid on such loans. Almost all leading banks like HDFC Bank, Axis Bank and ICICI Bank etc. offer this type of loan. Popular home-construction loan schemes are offered by UCO Bank, Bank of Baroda, Canara Bank etc. If you already own a house but don’t have an adequate fund to renovate it, you can apply for Home Improvement Loans. Renovation includes: external or internal painting, digging a bore well, bathroom renovation, major repairs, electrical renovation, etc. Some of the banks like Union Bank of India, Vijaya Bank and ICICI Bank are providing specialized home improvement loans. If you are planning for home expansion like adding a swimming pool, constructing a balcony and extra floor etc., banks like HDFC Bank and Bank of Baroda offer loan for house expansion. However, some banks consider it as home renovation loan. If you already have a home loan in your name that you had taken to buy a new house, but now wish to purchase and move into another new home, you can apply for conversion loans. By transferring the current loan to your new home, you can fund the purchase of the new house while retaining the earlier home too. Although this type of loan may prove to be convenient, it is comparatively expensive and is provided by a few banks like HDFC Bank. NRI home loans are exclusively designed for Non-Residents Indians who are wishing to buy residential property in India. 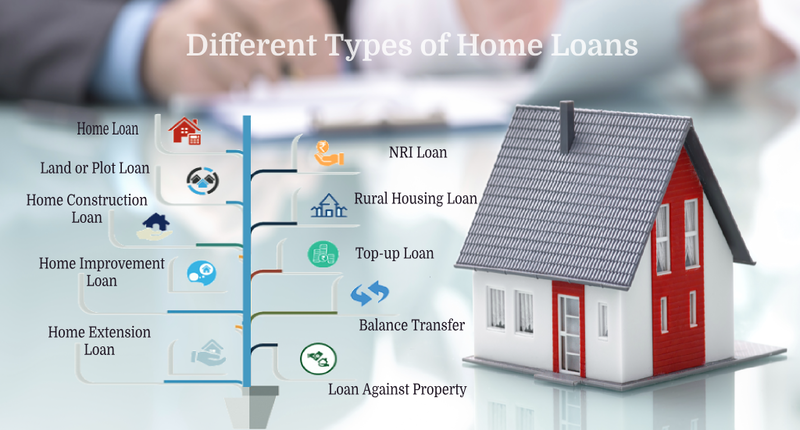 Except the documentation part which is a bit different, the procedure for applying for NRI home loan is more or less the same as regular home loans. Almost all leading Indian banks like the State Bank of India, ICICI Bank Ltd, Bank of Baroda, HDFC Bank Ltd, HSBC Bank, Axis Bank ltd, Citi Bank, etc. offer NRI home loan. If your current lender is charging high interest rate or you are not happy with the services of the lender, you can opt for a balance transfer loan. Under this scheme, the loan is transferred from existing bank to another bank. Many banks like ICICI Bank, Kotak Mahindra Bank and Deutsche Bank, etc. offer this facility. A distinct variant of home loan also includes an option of a combined loan given to an individual to buy a plot and construct the home on the same within the provided time mentioned by the bank. Banks and NBFCs provide Home Loans not only for buying houses but also for various correlated purposes. So, before you apply for a home loan, you should understand each of the options to find out which one is best for you based on your requirement. To explore best home loan schemes from different lenders, log on to www.afinoz.com or mail us at info@afinoz.com. We are here to serve you the best financial products without any hassles.